Western Europe will always be popular to tourists because they it is far more. Not to mention the much warmer weather compared to Eastern Europe that tourists enjoy. But the following countries all have something to offer and should not be shunned on the count of some of lack of infrastructure which may hinder them. Since coming out of the Communist bloc they have started to integrate into Europe and provide tourists with a much more accommodating experience. Gone are the days where westerners will be looked upon with suspicion and spied on by KGB agents (just some of the telling tales former tourists came back with on previous escapades). Bulgaria is located to the west of the Black Sea and is an important trade route for the world. Being close to the Turkish straits means its tourist routes are open to Europe and the Middle East. Yet for some reason Bulgaria remains an underrated country for tourists who do not travel to see the beauty of Bulgaria in there millions. The country is blessed with mountainous regions accompanied by cold snowy weather in the winter but hot and humid summers. If you visit the country you will be immersed into the local traditions as the Bulgarians are naturally considered a friendly people. For instance on March 3rd you can find yourself celebrating Bulgaria’s liberation from the Ottoman Empire. Or Ss. Cyril and Methodious day on May 24 will see you joining in the local festivities where a vivid display of flowers are on show, folksy music is playing in the background and the odd drink is shared. The capital Sofia is the engine of the country. But this should not be mistaken for some kind of industrialised town. Sofia is blessed with lovely parks, bars and pubs. As one of the oldest cities in Europe, Sofia have over two hundred and fifty monuments and historical landmarks. So there’s no shortage of things to do or places to visit. Croatia is near the Adriatic Sea and the Balkans. The northern terrain is mainly hilly and this gives way to a very cold climate. The part of Croatia located by the Adriatic Sea has a very Mediterranean feel to it and is warm. Croatia has the privileged title of being the first country in Europe to start the concept of commercial naturist resorts. There are twenty official nudist beaches in Croatia, where tourists are allowed to bare there private parts without being hauled away in handcuffs. The most popular beaches are Pula and Hvar, so for those tourists that love to run around naked in public and express themselves, Croatia is not only worth visiting but perhaps moving too! Just don’t forget to apply sun block on parts of your body you usually wouldn’t. You can sail around the small archipelagos in Croatia as an alternative or go to the capital Zagreb and take in the culture. Croatia too has a medieval feel to it via its architecture and cobbled streets. Local cuisine is diverse so it’s hard to pinpoint one national dish. Spicy sausage is popular in the east but the Shepherds Stew is a favourite among many as it involves a number of tasty meats cooked to a slow boil. Hungary is in Central Europe and this makes it easy for tourists to access the country. The broad spectrum of weather really can go from one extreme to the other. In harsh winters the climate in the eastern parts can plummet to minus twenty degrees. Summers can be extremely hot reaching the high thirties and this can be followed by many thunderstorms leading up to the autumn period. 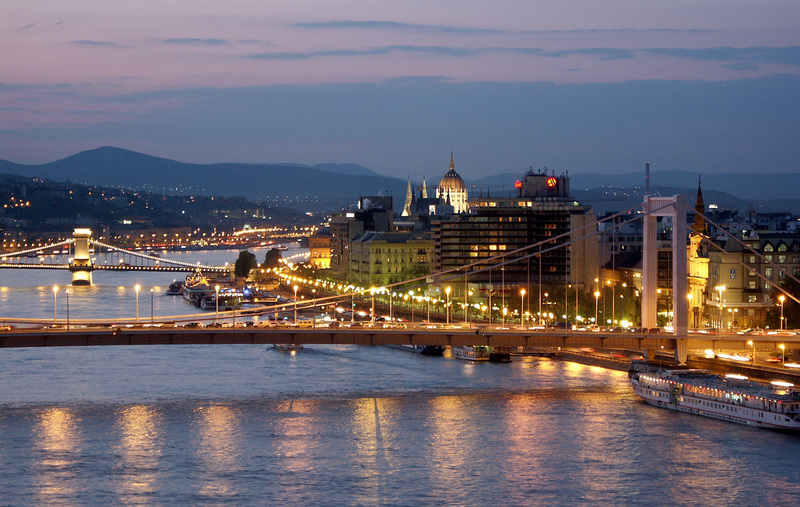 Hungary is one of fifteenth most popular destinations in the world and its capital Budapest (pictured) regarded as one of the most beautiful. There are a number of UNESCO World Heritage Sites that tourists can visit, many within walking distance of each other. Lake Balaton is the largest lake in Central Europe and breathtaking. The biggest area of open grassland can be found here too in Hortobogy. Hungary is also home to the largest Synagogue in Europe, so has a special attachment to those tourists of the Jewish faith. In terms of architecture Hungary has castles and churches in abundance and can be found in the city of Eger. Fancy some vibrant music and plum brandy? Pack your bags for Kecskemet. Students and youngsters head on down to Gyor, which is full of cafes, restaurants, nightclubs and bars. Poland is in Central Europe, surrounded by an assortment of countries but has a lengthy Baltic Sea coastline. The weather is fairly unspectacular in the sense you get mild winters and mundane summers, but this should not detract from a country that is full of natural beauty. The capital Warsaw is starting to bring in a flurry of tourists since it joined the EU. Thriving new business centres and the abolishment of derelict old towns has really pushed the levels of modernity. There’s the Bieloweisa National Park on the border with Belarus if you want to see scenic views, also a World Heritage Site recognised by UNESCO. The Masovia region known as the “Manchester” of Poland is brimming with manufacturing sites and museums that may intrigue tourists. Perhaps the countryside seems more alluring, if that’s the case head to Warmia Masuria a green region with lucid lakes. Lubusz adds to the natural feel surrounding Poland with its diverse landscape and inland dunes. The bird life also attracts avid bird-watchers from all corners of the planet. Lovers of nature will enjoy Poland and is highly recommended to tourists. Slovenia is surrounded by many elements. It is bordered by countries such as Hungary and Croatia but by the Adriatic Sea and the eastern Alps on its northern borders. The terrain it possesses is of a great variety. It has the beaches of the Mediterranean, the peaks of the Julian Alps and rolling hills in the south. This gives tourists an array of choices in terms of things to do. The architecture in both the countryside and cities surrounding the Julian Alps are similar to Austria. Tourists will want to take their cameras to snap up pictures of roadside shrines and baroque steeples. The Julian Alps is also home to Triglav National Park, a frequent destination travelled to by tourists. The cities of Maribor and Ptuj also have some fine vineyards should you wish to do some wine tasting. There is a strong Hungarian influence in these cities and is built around the Drava and Mura Rivers where you can take boat rides and go fishing when the weather’s appropriate. The capital Ljubljana is very urban and modern and will cater to all your needs. Shopping for gifts, eating out and sampling the local cuisine in elegant restaurants is the norm here. Slovenia was not apart of the Eastern bloc and is a pretty affluent country, so travelling here is safe. Safety standards in these parts of Europe have improved. Unlike the west, much of the region still possesses natural beauty in bucket-loads. For those tourists on a tight budget, Eastern Europe is definitely for you. It is cheap and cheerful and you will enjoy your time in these various countries.